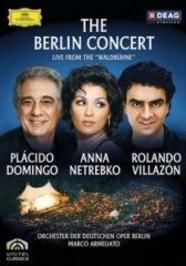 On July 7th, the Waldbühne amphitheatre in Berlin was host to “the greatest voices of their day” (Die Welt am Sonntag) as more than 20,000 spectators gathered to hear Anna Netrebko, Rolando Villazón, and Plácido Domingo in an open-air concert celebrating the close of the World Cup tournament. Deutsche Grammophon has brought this extraordinary event – described by the Berliner Morgenpost as “the stuff of myth” – to DVD, featuring the three mega-stars performing music by Verdi, Puccini, Lehár, and many other beloved melodies. This live broadcast had an international audience of more than 8 million viewers in Germany, Austria, Norway, France, Italy, Mexico, India and South America, generating waves of enthusiastic acclaim in the international press - considered as the biggest live classical broadcast event since The Three Tenors. 3. Gianni Schicchi - "O mio babbino caro"